This is probably the most interesting phone I have reviewed in a while. Not only has this inspired many conversations, but it has been a while since people have actually looked at the phone I am carrying, stopped and said, “oh… what is that?”. So… what is it really? 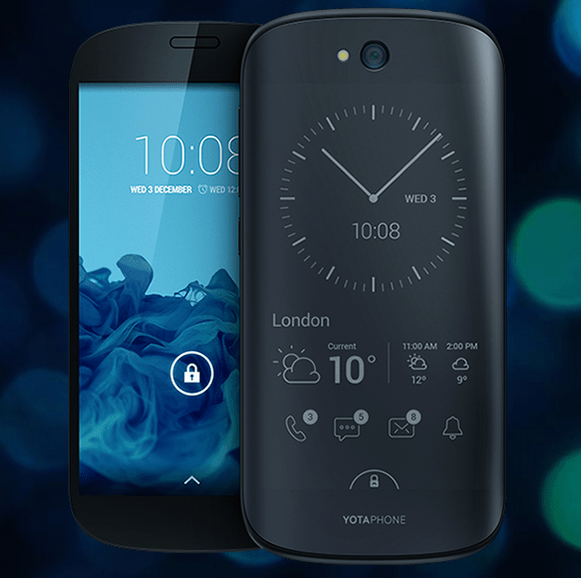 The YotaPhone 2 is the second offering from Yota, a Russian company, that brings you a dual screen display. A normal 5″ AMOLED Full HD (1920 x 1080) display on the ‘front’, and a 4.7″ e-ink display with 16 levels of grey, 235ppi, full capacitive touch. It has Corning Gorilla 3 on both sides. Yeah, you read that right. It has two displays, and it ain’t scared to flaunt them. You can use the always on display to show the colour display, but obviously low resolution and grey scale affect the quality of image/experience. I had a lot of interesting reactions from people as I ‘flaunted’ this phone. This is brilliant, but don’t use it for the main screen. I prefer the blocks and dedicated texts they have there. Wow, I don’t believe it. I thought that was a fancy case! How can you put a case on it? Oh, both sides of the screen can be smashed. This is just great! I wish I had that after my first Nokia went! What do you use it for? The battery? What is the battery life like? Before I proceed, I have to make one thing clear. This phone costs £555. This makes it more expensive than the likes of Nokia Lumia 930, the LG G3, the S5, and puts it in comparable cost to the iPhone 6 and the Galaxy Note 4, 2 of the more expensive sets on the market. I also mention this as when it first came out, I was going to buy it. After all this phone offers what nothing else does, but the price put me off. Sad, but true. Now, you do get a lot for your money. You get a very decent phone, with great specs. It doesn’t look as flashy as the iPhone or the Galaxy Note, but it definitely is a workhorse, and then there is the second screen. Yeah, you get what you pay for with this phone. This phone does look very similar to the Nexus 5 or the Moto G. The 8MP camera doesn’t help either. This means that a lot of people will do the unfair analysis of adding the price of a basic Kindle, £60 to the price of a Nexus 5, and say that this phone should be half its price. It should be, if it was 2 devices. It isn’t. It is one. In a neat little package too. It also offers wireless charging which a lot of the high end phones don’t, yet! As I have just mentioned, it doesn’t look or feel much different from something produced by Motorola. A black display with thin bezels on the front, and a curved back with the camera on the top. Of course, the back does hold the all so important e-ink display in it as well. While there are two screens, somehow you get the feeling that the e-ink display is more robust than the front. Probably just the way it looks. I also keep getting the feeling that the phone should be waterproof. Probably a wish of mine coming into play. There are speakers at the bottom, with the micro-USB port, while the volume keys also cleverly hold the nano-sim in them as well. This phone is thin, and feels well in your hand. You have to remember they have managed to fit two displays in there, and oh yeah, the little matter of wireless charging too! As you can see from the specs, it is a pretty decent phone. Yeah, more RAM would have made it faster, and an SD card slot would have been nice, and it could definitely have benefited from a higher pixel or better camera. However, in my week or so of using this phone, it hasn’t crashed on me, I haven’t found it sluggish at all, and it has behaved as any good phone would. It all works, and it all works perfectly. There are very slight modifications to basic Android here, so it pretty much feels like Vanilla Android. The few changes they have made are in line with what was required. For example, unlocking the screen shows the unlock as well as two other options, which are YotaMirror and Screenshot. YotaMirror lets you duplicate whatever you have on the front at the back. We will talk more about that in the ‘e-ink’ experience. There are the Yota Apps. They come as ‘YotaHub’, which lets you configure the e-ink display, with widgets and what not, and the ‘Yota Apps’ which include a Reader app, an RSS reader, a tutorial and games such as Sudoko, Chess and Checkers. The games only work on the always on screen. Other than that I have nothing to add I am afraid. It is a good, decent, fast phone, which ticks all the boxes. So, how does the ‘Always On’ display work? Quite well, but it has its limitations, being e-ink and all. By default, the rear display, or the e-ink display, allows you to configure a set of screens that offer you various widgets, of various sizes. The widgets include items like clock(s), calendar displays, email, texts, notifications, battery remaining, games, Twitter and other feeds, etc. You can pretty much configure it how you want, and then you can switch between different screens as and how you like. There is a dedicated screen for the reader app as well, which lets you read books. The Reader app though, doesn’t come with buying options. You have to upload files such as txt files, mobi files, etc and get them to read in the app. This isn’t absolutely straight forward, but once you have figured it out, you just manage. The problem is that if you have already invested in a massive Kindle library, that won’t work for you. Of course, you can use the YotaMirror app to read your Kindle books on the back easily. Reading on the display is a good solid experience, what you would expect from any e-ink display. It isn’t lit, which took me by surprise. One tends to forget such things when using a phone you see! However, it displays well, and you have to finger swipe to change pages. All good once you get the hang of it. The screen is capacitive touch, and it feels a bit slow to respond. That doesn’t surprise me though. It is a new technology, and the delay is probably the e-ink responding, rather than the phone reading. So, how does ‘normal’ phone display look on the back? Not that great. They probably need to configure a high contrast version of what is available on the front to make it work better, but it does the job, if you want it to. Typing feels a bit weird on the back, because of the slower response, and the curved screen doesn’t help either. Other than that, it works great for texts, emails, that sort of thing, while of course Instagram or quick swiping through feeds such as Twitter work better on the front screen. I ended up using the notification screen on the Yota to great advantage though. It is always on and prevents you from constantly looking at your phone. Combined with my Pebble’s notifications, it meant I could totally silence this phone. So did I charge this device just the once over my week of usage? Hell no! It still takes a charge every night, but it lasts through the day comfortably. I, of course, will use a phone more than normal, because I am testing it. There is something called YotaEnergy, which promises to deliver a lot more life. However, this comes at the cost of basic functions such as WiFi and Bluetooth, which aren’t very practical in normal usage. Yeah, you’ll get a very comfortable day, or 2 days on a stretch, but do not expect miracles. And the phone can be bought directly from the website too, for the already mentioned price of £555. Of course, if you find this to be a bit too expensive for your taste, you can always go for the first YotaPhone, which retails for just over £300. This is one of the most interesting phones I have tested. I am a bit sad about it being so expensive, but it definitely integrated into my daily life well and I will miss it when it is gone back. Hopefully, as the technology develops, the price will come down, and we shall see more people carrying this phone. Next story Could Your Home Be Smarter? I’m so tempted to sell my M8 and get one of these…. Don’t blame you. What do you think about the price though? It’s a lot of money, but it’s quite a unique phone. It’s the first I’ve seen with a genuinely useful new feature in years. That much is true… it definitely brings something extra to the mix. Not had that in a little while!